How does life work at the most molecular level? What are the most fundamental roots of health and disease? How do medications work when they treat and sometimes cure disease? How are genes controlled as they determine our traits? Those are some of the questions addressed by biochemists and molecular biologists. Biochemistry and molecular biology are two of the most actively growing areas of science. At Carroll College, we don’t see these disciplines as separate. Rather, we recognize them as being highly integrated and tied together. Because of this, we have designed an innovative major that exposes students to biochemistry and molecular biology in a highly interdisciplinary way. Our students are provided with opportunities to study the most fundamental aspects of life in ways that challenge them to develop strong deductive, analytical and quantitative skills. 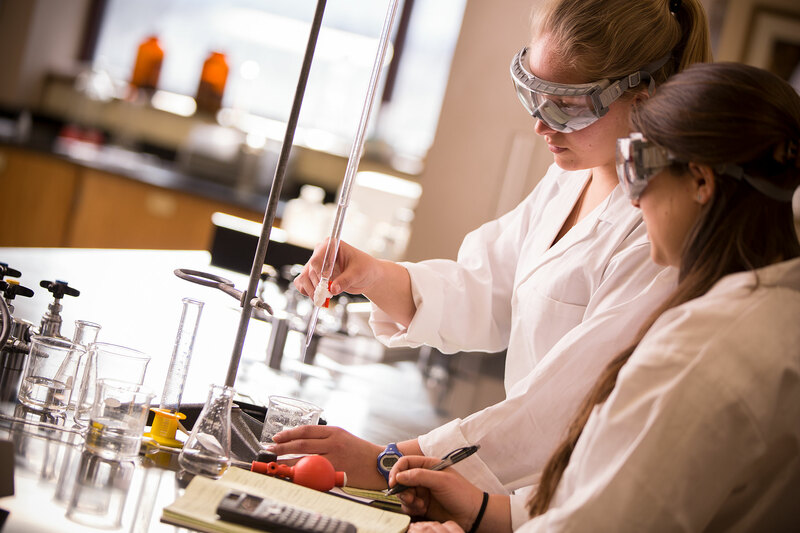 The best of both worlds: Quality teaching from highly experienced instructors makes a science education at Carroll College so valuable. The BMB curriculum allows students to experience excellent cross-disciplinary instruction in biology, chemistry, physics and math. However, an education in BMB goes much further. Carroll faculty are actively involving students in cutting edge research projects. For example, some students study the biochemistry of neurodegenerative diseases while others perform research on the West Nile virus in Montana. Working directly with your professors both inside the classroom and in the research lab, makes a BMB education at Carroll the best of both worlds. Why study Biochemistry-Molecular Biology at Carroll College? There's so many reasons, but check out our top ten! Molecular biologists study topics such as how genes are controlled. Wouldn't you like to know? Understand life, health and disease at the molecular level. Be a part of one of the most rapidly growing areas of science. Have professors that work with you personally in small, cohesive classroom settings. Have opportunities to do cutting edge research in the lab and in Montana’s great outdoors. Work in state of the art facilities with major renovations on our picturesque campus. Have excellent equipment for lab courses and for research as an undergraduate, without competing for these opportunities with graduate students. Be competitive for cutting edge internship opportunities in Helena and around the nation. Molecular biologists study topics such as how genes are controlled. Here, a molecular graphics program shows a DNA binding protein wrapped around a DNA molecule in order to control the expression of a gene. Biochemists are interested in all aspects of life at a molecular level. Such studies help us understand the basis of disease and help us design medications to treat those diseases. Here, a molecular inhibitor blocks the active site of an enzyme. Such strategies are common in disease treatment.